Please write the name of the voucher recipient here. Please insert your email address here. 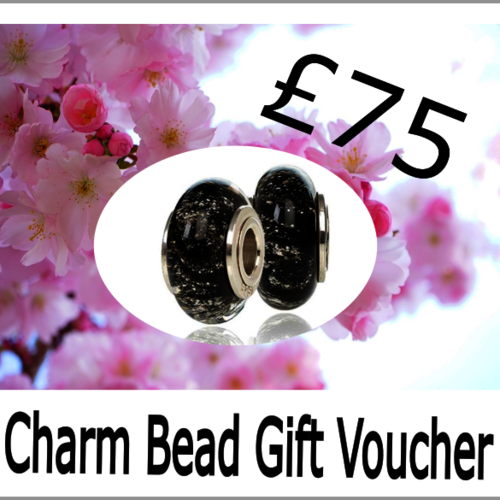 If your unsure what they would like why not purchase a Gift e-voucher, they are a great way to order for friends and family giving them the option to choose to spend it on the Charm Bead colour they would really like. 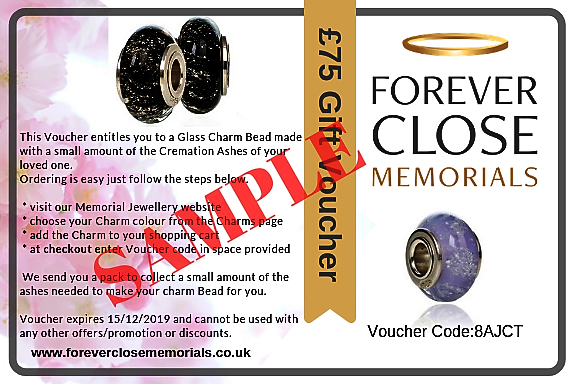 They come in 10 different colours and will contain a very small amount of your Loved Ones Ashes. Once the ashes are inside the glass they become a part of the design, adding to the beauty of the charms. Your charm will be hand-crafted individually by skilled glass and Jewellery designers in our Berkshire Glass Studio. Once you have purchased your Gift Voucher we will process the order and generate a unique code for the voucher amount. This code will then be emailed to you the buyer, from there you can email it to the recipient (or recipients) of your choice. 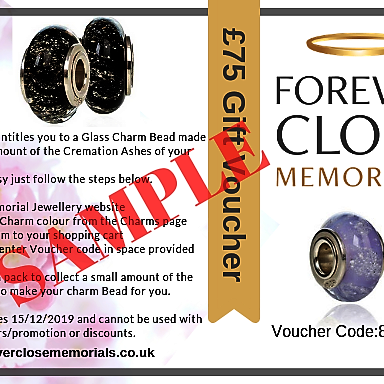 Vouchers are redeemed by the recipient by visiting our website and adding the charm bead they would like in their basket, once at the checkout they enter the voucher code and their details so we can send them the order pack to collect the ashes needed for their charm. 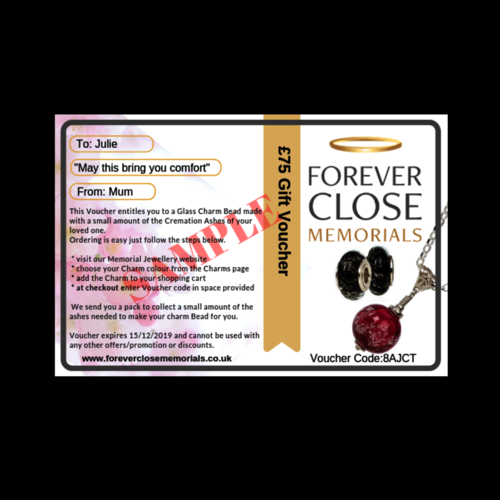 Forever Close Memorial e-Vouchers cannot be used on Trade accounts or with any other offers. 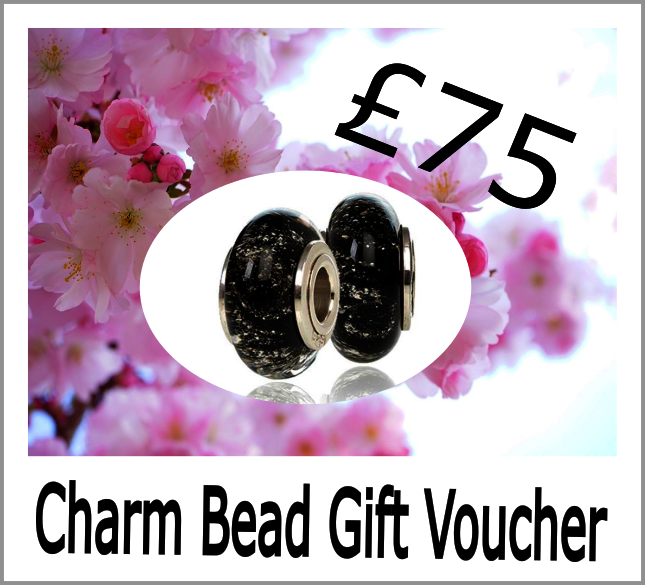 Contact us if you would like to order a Voucher of a different amount.